I like how he's eyes are green. Cute! I totally love when those two are together! They are perfect together! They're both popular, and they're both Japanese! 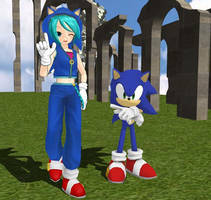 Gumi: Miku take that costume off you and i have a concert in a hour! If I threw up on a plate and took a picture of it itâ€™d be better than this. machine they were using went wrong. And she sat there in agony for hours until she died. Sonic.EXE: >X'D BELIEVE IF YOU ARE A IDIOT! Dude, I haven't even been here for six months and even I KNOW this is a scam due to previous experience & I'm not dead. Sonic: AWWW YEAH! This is happenin! It is a wonderful illustration. This work is your original? Should be reported to the author of illustrations was the source. This is awesome! My 2 fave characters well done! this is going in my favorites.